Transparency Market Research (TMR) witnesses the global medical image analysis software market has a highly competitive and fragmented vendor landscape. However, the market is dominated by the handful of the companies. Some of the companies dominating the global medical image analysis software market are Siemens Healthineers, Agfa-Gevaert N.V., GE Healthcare, Hologic Inc., Pie Medical Imaging, Philips Healthcare, Toshiba Medical Systems Corporation, and Sciencesoft USA Corporation. 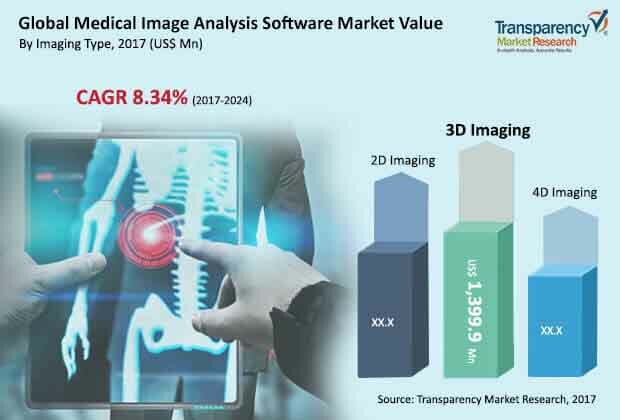 According to TMR, the global medical image analysis software market pegged the value of US$2,664.3 mn in the year 2017 and is expected to attain a value of US$4,668.8 mn by the end of the year 2024. The market is anticipated to swell with a CAGR of 8.34% over the forecast period from 2017 and 2024. Based on software type, the standalone software segment accounted for the share of about 53% among overall demand in the global medical image analysis software market. Based on the imaging type, the 3D imaging segment accounted for revenue of US$1,400.0 mn in the year 2017. Based on the region, North America dominated the global medical image analysis software market followed by Europe. The market in North America generated revenue of about US$893.5 mn and Europe accounted for US$710.9 mn in the year 2017. Growing prevalence of chronic diseases coupled with growing demand for novel diagnostics solutions spurs demand for medical image analysis software. High investment and growth of the industry are increasing usage and uptake of image analysis for diagnosis is propelling adoption of medical image analysis software, which in turn is fuelling the growth of the global medical image analysis software market. Shifting focus toward the enhanced care is leading to incorporate numerous diagnosis systems. Additionally, the introduction of technologically advanced products including 3D or 4D imaging technologies are augmenting demand for medical image analysis software. The aforementioned factors are likely to propel the growth of the global medical image analysis software market. Furthermore, the factors such as flexibility and high-quality images over the usage of multi-model integrated work procedures are expected to augment penetration over the forecast period. Additionally, hospitals and numerous end users are increasingly demanding the stand-alone platform, which in turn, is propelling the growth of the global medical image analysis software market. The solutions offer attractive features for analyzing data for enhancing the ability for research, diagnose, and observe the diseases. Thus, the healthcare providers are increasingly adopting the medical image analysis software and supporting the growth of the global market. However, the high cost of equipment coupled with lack of professionals and operators are hampering penetration of the medical image analysis software, which is a key factor restraining the growth of the global medical image analysis software market.